It's that little section you see on websites, pioneered by Amazon. In a way it pigeonholes you, recognises you as a certain type of person, 'if you like that then you'll love this!' type of thing. My kids eat those little yoghurt pots by the dozen. They're too small to satisfy so they end up scoffing about ten of them. A while back I got a load of old lolly moulds, (the type you make yourself with real juice) I removed the lids from the yoghurt pots and slotted in the stick part... so now I have loads of little yoghurt lollies. The kids love them and can only ever manage 1. Over the space of last year the sticks got scattered to the four corners of the townland, so I had to find more. 'OK my Love tell me as many items as you can remember starting from… now! OK Bruce - The Igglepiggle DVD, the bag of 100 wooden lolly sticks, Charlie and Lola Box set, The Little Book of Wanking, Indianna Jones Videooooooooooooooooo! 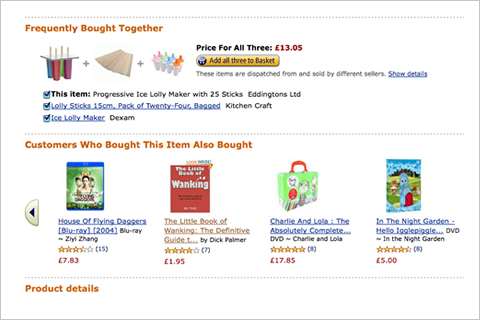 Yes that's right, people who make home made lollys also like "wanking". This is what happens when you have an algorithm as opposed to a human being making these suggestions. The program doesn't see the child sitting on your knee as you scroll through the suggestions, it's just given an instruction and off it goes. Of course I clicked on it to see if it was for real. It was, and it had a few glowing reviews. "This book has improved my wanking 1000%. I am now deaf, blind and insane but very very happy! " "I do not advice any one to buy this book at all. I do not want to give it even one star but I can not preview this without it." Probably most disturbing is the fact that there are 3 second hand copies available!!!!!!! Errrr........... those lollys should be ready round about now.